Or the reason we told Annelise she'd have to miss a school friend's birthday party (Do these things ever stop? Since it was a water party and parents were invited to partake in the fun too, I feel confident we made the better choice--plus we had already bought our tickets.) Annelise also had to forfeit a sleepover (she had invited herself in her head) at Pappo and Grandma's house because she needed to be *fresh* for the matinee (read: not overindulged and sleep deprived). Once she got over all of that, she totally soaked up the prairie experience and enjoyed herself. Now it's our turn to pose. 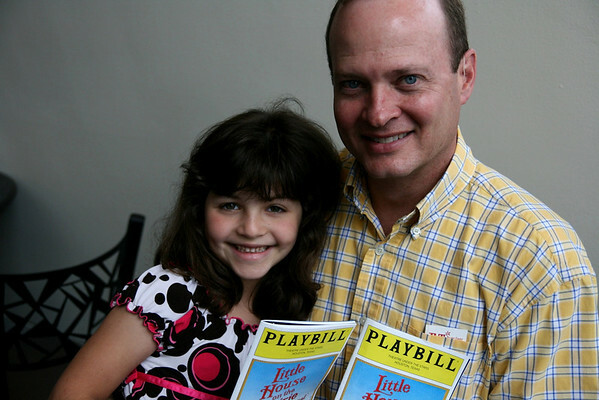 Over the last few years Annelise and I have read together Little House in the Big Woods, Little House on the Prairie and On the Banks of Plum Creek and have enjoyed escaping back to simpler times with Laura and her family. 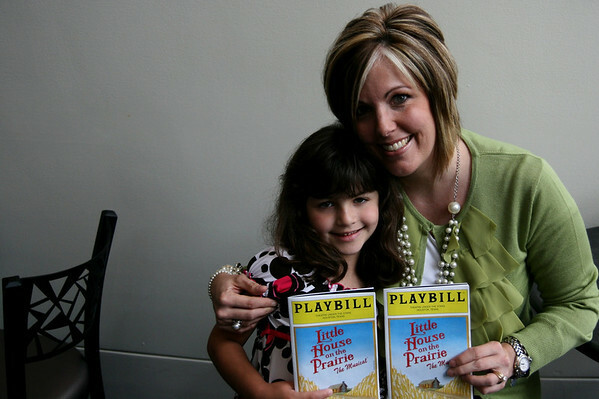 When we heard that the musical was coming to town we thought it would make a perfect family outing, which of course it did. 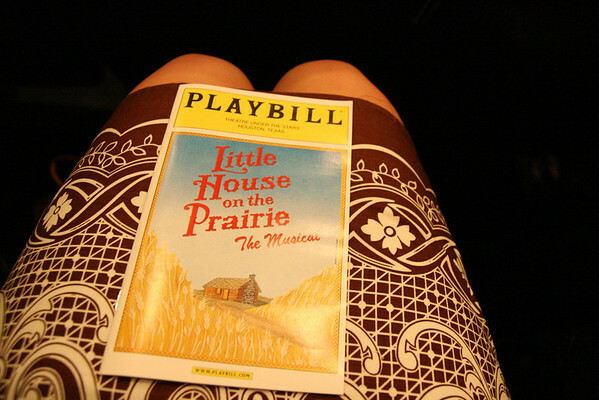 The musical is based on the Little House books, not the TV series, and featured Melissa Gilbert in the role of Ma. Seeing her in this role, instead of Laura was quite freakish, but all in all she did a good job. The actress that played Laura was outstanding, and I might regret admitting this, but Nellie Oleson was enjoyable as well (in a perfectly she's so spoiled and awful kind of way). There was plenty of humor along with a strong message about the importance of family, making the best of hard circumstances and even some courting between Laura and Almonzo which was sweet. I highly recommend you seeing this show if you get a chance. 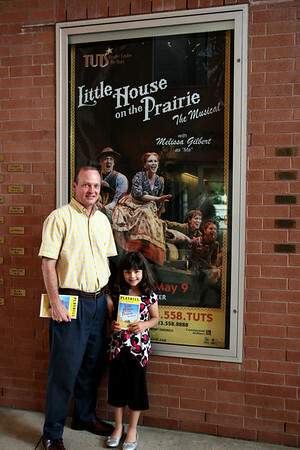 I don't know if it was a combination of enjoying the show with my own daughter, feeling joyful that she is growing up with Laura Ingalls and Little House on the Prairie (granted, with some nudging from moi) like I did, or seeing Melissa Gilbert as Ma and remembering her as Laura, but during the finale (the cast performed a fun dancing number) I was quite surprised to find myself choking back semi-sobs with tears threatening to spill over my bottom eyelids. What in the world?!?! After the show we paused for obligatory photos beside the poster. 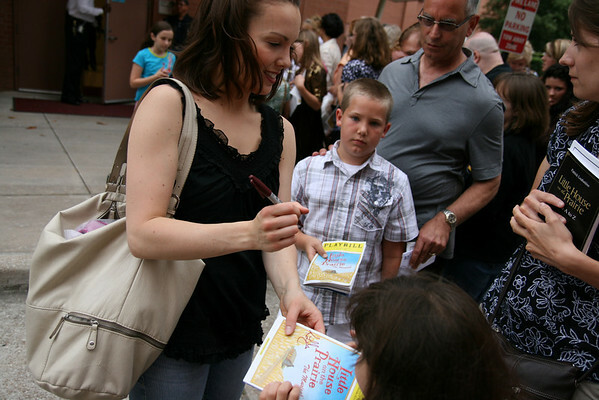 We waited by the stage door for a bit while Annelise got the autograph of the amazing actress who played Laura. We were hoping (okay, maybe it was just me) to get Melissa Gilbert's autograph, but they announced that it was her birthday that day and they were having a cast party. Rats. While Annelise's excitement was still high on all things Little House, I capitalized on that by suggesting we read By the Shores of Silver Lake last night before bed, and she eagerly agreed. My youngest is all about Little House on the Praire. DeSmet, SD where the Ingalls made their homestead and where she wrote many of her books is only 30 or so miles from us! One more thing: The Musical is here in June, we have tickets for June 4th. I'm so excited to hear that you loved the play! I'd love to take a road trip someday and see the Laura's homesteads/museums in Minnesota, South Dakota, Missouri, etc. I didn't realize how much they moved until I looked at a map! Maybe when Annelise is a little bit older. Did I miss it in the post, or who is the lady signing the playbills in the last pic? Sounds like a great time. BriteCloud: That was the actress that played Laura. She did an AMAZING job!! 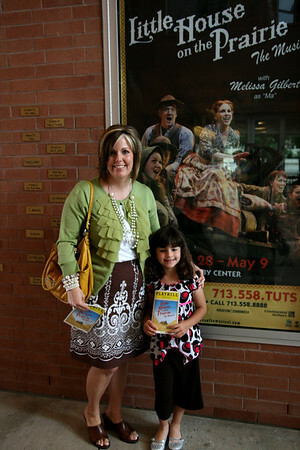 You all look great in those Playbill shots! I'd love to see this musical, I hope it comes to our area. Max is a huge fan of Pa and he loves listening to the series on CD from the library. Thanks Anna! If the play does come your way I think Max would enjoy it. It was difficult to see actors other than the TV ones (well, except for Melissa) playing the roles--which shows how engrained that series is in my mind. I remember feeling disappointed when I saw actual photos of Laura and her family and they didn't look like Michael Landon, etc. Um...reality check! Oh BOY, I love that green cardigan you're wearing! Beautiful. I'm sure I've mentioned this before when you've posted about Little House, but I love those books so. We were on a binge last summer, then got sidetracked into reading some other book aloud....so I think we'll read about the Ingalls fam again this summer! Your family is so great about doing fun things like this, I really need to be better. How cool to have Melissa Gilbert in the show!